Swindon failed to score for a third consecutive game as they drew at promotion-chasing Gillingham. Rory Donnelly and Josh Wright were denied by Robins keeper Lawrence Vigouroux, while Bradley Dack hit the side netting for the hosts. Jonathan Obika had an effort blocked at the other end before Donnelly then headed straight at Vigouroux. 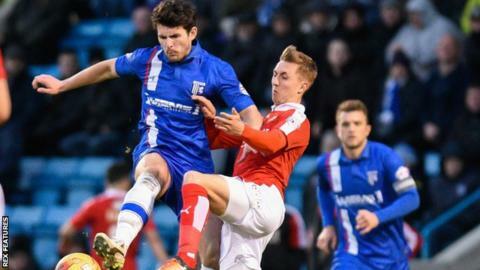 John Egan also went close for the Gills when he fired wide but Swindon held on to avoid a third 1-0 defeat in a row. Match ends, Gillingham 0, Swindon Town 0. Second Half ends, Gillingham 0, Swindon Town 0. Substitution, Gillingham. Elliott List replaces Rory Donnelly. Attempt missed. John Egan (Gillingham) right footed shot from outside the box is close, but misses to the right. Corner, Gillingham. Conceded by Brandon Ormonde-Ottewill. Substitution, Swindon Town. James Brophy replaces Yaser Kasim because of an injury. Attempt missed. Josh Wright (Gillingham) right footed shot from outside the box is close, but misses to the right. Substitution, Gillingham. Brennan Dickenson replaces Adam Chicksen. Attempt missed. Ellis Iandolo (Swindon Town) left footed shot from outside the box is too high. Dominic Samuel (Gillingham) wins a free kick on the left wing. Foul by Lee Marshall (Swindon Town). Corner, Swindon Town. Conceded by Max Ehmer. Attempt blocked. Jonathan Obika (Swindon Town) left footed shot from outside the box is blocked. Attempt missed. Nicky Ajose (Swindon Town) header from very close range is close, but misses to the left. Substitution, Swindon Town. Lee Marshall replaces Fabien Robert. Attempt missed. Brandon Ormonde-Ottewill (Swindon Town) left footed shot from outside the box misses to the left. Attempt saved. Josh Wright (Gillingham) header from the centre of the box is saved in the top centre of the goal. Corner, Gillingham. Conceded by Yaser Kasim. Attempt blocked. Bradley Dack (Gillingham) left footed shot from outside the box is blocked. Doug Loft (Gillingham) wins a free kick in the defensive half. Foul by Ellis Iandolo (Swindon Town). Doug Loft (Gillingham) wins a free kick on the right wing. Substitution, Swindon Town. Ellis Iandolo replaces Anton Rodgers. Dominic Samuel (Gillingham) wins a free kick in the defensive half. Foul by Nathan Thompson (Swindon Town). Delay in match Rory Donnelly (Gillingham) because of an injury. Attempt saved. Anton Rodgers (Swindon Town) right footed shot from outside the box is saved in the top centre of the goal. Second Half begins Gillingham 0, Swindon Town 0. First Half ends, Gillingham 0, Swindon Town 0. Corner, Swindon Town. Conceded by Rory Donnelly.